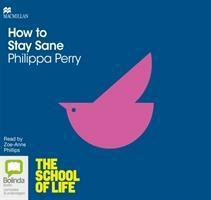 There is no simple set of instructions that can guarantee sanity, but if you want to overcome emotional difficulties and become happier, psychotherapist Philippa Perry argues that there are four cornerstones to sanity you can influence to bring about change. By developing your self-observation skills, examining how you relate to others, breaking out of your comfort zone and exploring new ways of defining yourself, she suggests ways of getting over your problems and feeling more "normal". This book explores techniques to help you find emotional equilibrium, such as practising mindfulness, being emotionally honest in your relationships with others, challenging your brain in new and exciting ways, and finding cause for optimism. Through case studies, practical exercises and stories of individual experience, this insightful and inspirational book reaches out to anyone in need of a little emotional support from time to time. Philippa Perry is a psychotherapist who, in an attempt to demystify psychotherapy, wrote the graphic novel, Couch Fiction. She has written for The Guardian, the Observer, Time Out and Healthy Living magazine and has a column in Psychologies magazine. She lives in London and Sussex with her husband, the artist Grayson Perry and enjoys gardening, cooking, parties, walking, tweeting (@philippa_perry) and watching telly. Zoe-Anne Phillips is an extremely versatile performer who has worked on a range of projects from acting in dramas, corporate videos and commercials to presenting on BBC radio and shopping TV. Zoe has also recorded TV and radio commercials, documentary narration, promos, idents, English as a foreign language recordings, audiobooks and animation. Zoe is based in Croydon and works nationally and internationally.